The AIDS epidemic of the 1980s dealt a devastating blow to the gay community. Some of the headway gained in the 1970s gay liberation movement was negated in the 1980s because of the scapegoating of gay men as the cause of the epidemic. Advocacy efforts also took a back seat to caring for people with AIDS and educating the public about the disease. Yet, in Parliament was the workings of bringing about changes to Canada’s Charter of Rights and Freedoms that would have significant impacts for LGBT equality. 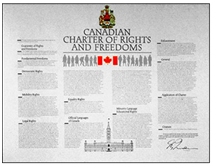 In 1982 the Canadian Charter of Rights and Freedoms was entrenched in the Constitution of Canada. It replaced the Bill of Rights which was not a part of the Constitution and applied only to federal and not provincial laws. When the Charter became entrenched in the Constitution, any denial or infringement of the rights and freedoms could be enforced by the courts. Section 15 (below), guarantees equality under the law and protection against discrimination – it did not provide for discrimination against sexual orientation. (View the full text of the Charter here). It did not come into effect until 1985 so as to give the provinces time to come up to speed with the constitutional changes. Power in the courts would become significant as many cases about equality as outlined or interpreted in the Charter of Rights and Freedoms regarding sexual orientation, would become prominent in the 1990s. Although advocacy efforts also went to AIDS education, the gay and lesbian rights movement shifted to politican activism. Groups such as EGALE, the Foundation for Equal Families, GATE (Gay Alliance Toward Equality) and LEGIT would become instrumental in cases that successfully challenged the Charter in the 1990s.